Hub Lisbon Patio Hostel i Lissabon, Portugal: Reservér nu! A very nice hostel with everything you need. 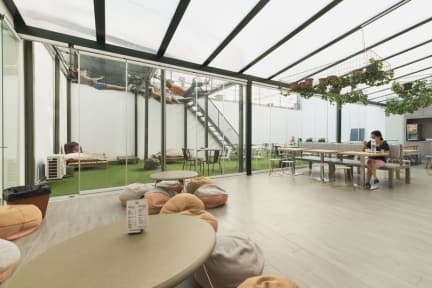 Nice spaces to hang out and a good and free breakfast in the morning. It is located about 15 minutes walk distance from the center of the city. A nice atmosphere, but it is not possible to party after 10 pm, so you have to go out if you want a night out. But all in all we would recommend this hostel to everyone! It's a OK stay if you exploring Lisbon and just using the hostel to sleep. We had breakfast included but the selection is minimal. The 6 person dormitory is small for 6 people. The location is a bit outside centrum but is walking distance from the big shopping street.